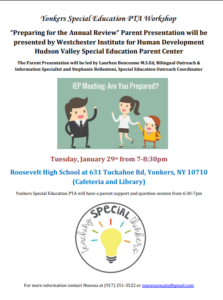 This presentation will provide parents with a broad understanding of what is typically discussed during a child’s annual review meeting with the Committee on Special Education (CSE), which reviews the student’s Individualized Education Program (IEP) and its effectiveness, resulting in recommendations for the upcoming school year. Specific tips on how to be better prepared to effectively participate in this discussion will be provided. Problem-solving strategies to address concerns will also be suggested to help parents work with their school team to achieve positive outcomes.